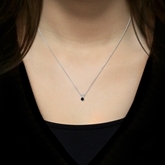 14k White Gold 4-Prong Basket Certified Round-cut Black Diamond Solitaire Pendant 0.25 ct. tw. 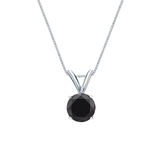 This elegant solitaire pendant features a 0.25 ct. total weight round-cut black diamond in 14k white gold 4-prong basket setting. 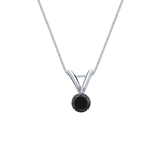 The pendant comes with a matching 18-inch box chain that secures with a spring-ring clasp. Total Carat Weight: 0.25 ct. tw. 14k White Gold 6-Prong Basket Certified Round-cut Black Diamond Solitaire Pendant 0.25 ct. tw. 14k White Gold 4-Prong Basket Certified Round-cut Black Diamond Solitaire Pendant 0.50 ct. tw. 14k White Gold 4-Prong Basket Certified Round-cut Black Diamond Solitaire Pendant 0.75 ct. tw. 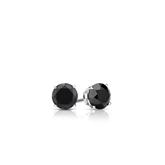 14k White Gold 4-Prong Basket Certified Round-cut Black Diamond Solitaire Pendant 1.00 ct. tw. 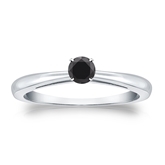 Certified 14k White Gold 4-Prong Black Diamond Solitaire Ring 0.25 ct. tw.